In case you are wondering what was my first CarouHELL experience, you can always view it here. I thank God how I have such kindness and patient in replying people like her (or in fact any other people) in my life. 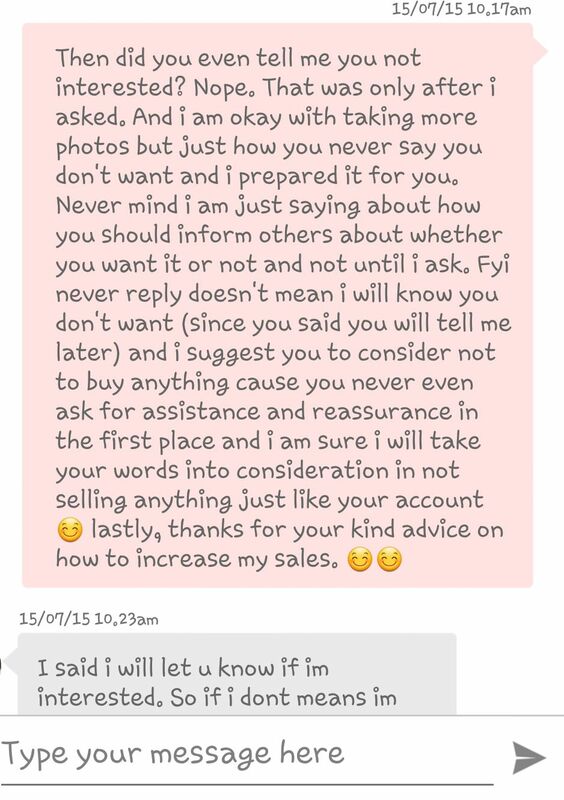 All this began when she asked if the item I am selling is for $5 (like seriously I wrote at my description but you still ask...) PLUS it's always items that cost $5 that creates so much trouble for me. So I decided that Tampines is way too far for people like me who stays at the other end thus I suggested a meet up at the central. She replied she will be at Scotts at 2pm. Here is the thing, if you never intend to meet me and buy this item, WHY ON EARTH ARE YOU TELLING ME YOU WILL BE AT TOWN?! 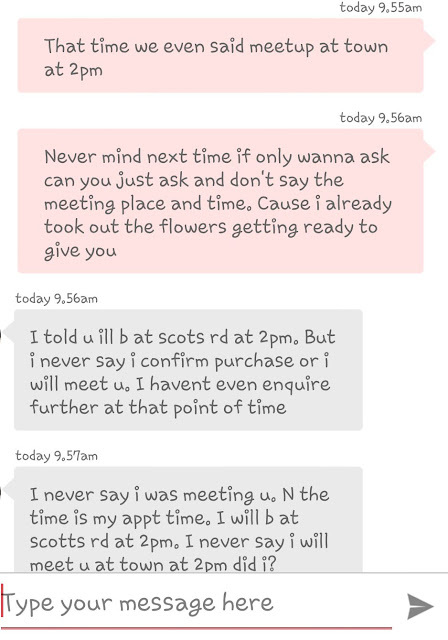 Like wts I don't need to know what time and where will you be if you are not even meeting me. Do note how I never complain about taking photos for her to see. 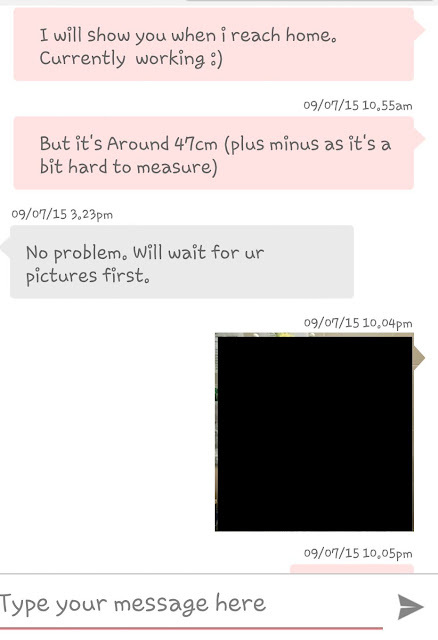 I even told her the measurements but since she wants to LOOK at the height/size, I took photo for her to see (and btw the photo on listing was already the actual photo I took). Me being all so nice even ask her whether she can see, you know, in case her eyes cannot SEE the height/size because one thing for sure, she is facing some issues LOOKING & UNDERSTANDING at my description clearly. For your information, I WROTE on my listing it's 10. ARE YOU TRYING TO SAY I AM LYING?! Oh yes maybe it's only 1 but I will like to add one more zero at the back to make it 10? "WILL LET YOU KNOW" - says someone who never even intend to let me know. 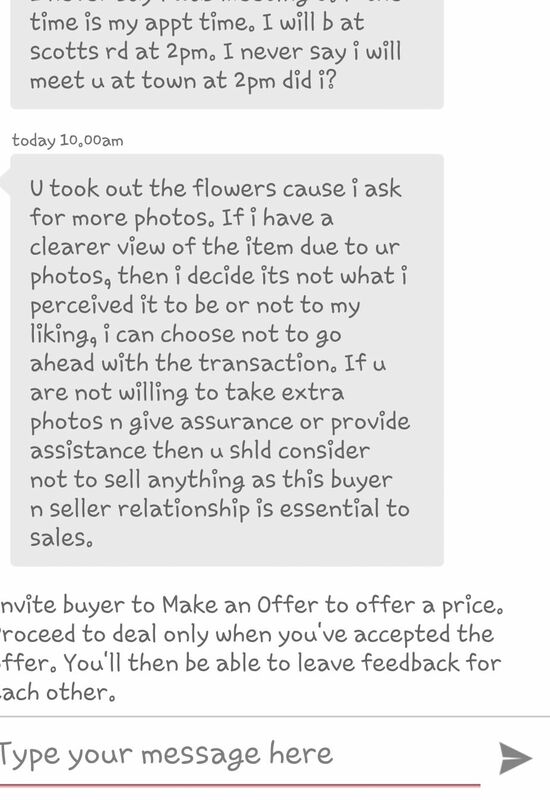 So 3 days later I still didn't hear from this woman who says will let me know, I decided to ask her if she is interested in the item. SHE REPLIED "NO THANK YOU" ONLY AFTER I ASKED (and she replied one day later so that makes it 4 days later). Okay I was getting a bit angry for the fact that she NEVER inform me about this and I already prepared the item for her. This is when things started to be a little more interesting (as always). 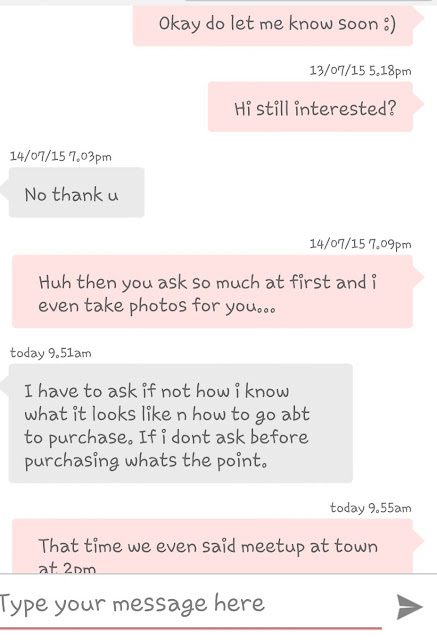 And she asked SO MUCH FOR SOMETHING NOT EVEN 10 BUCKS??? I started to question her on why she informed me in the first place she will be at Scott at 2pm. 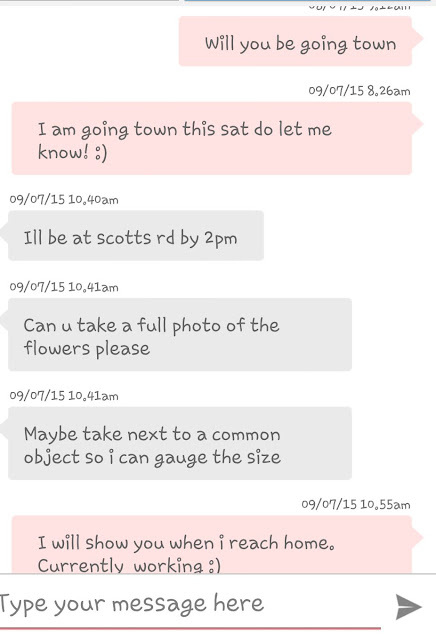 It feels like she was informing me 'Let's meet at Scott at 2pm!'. 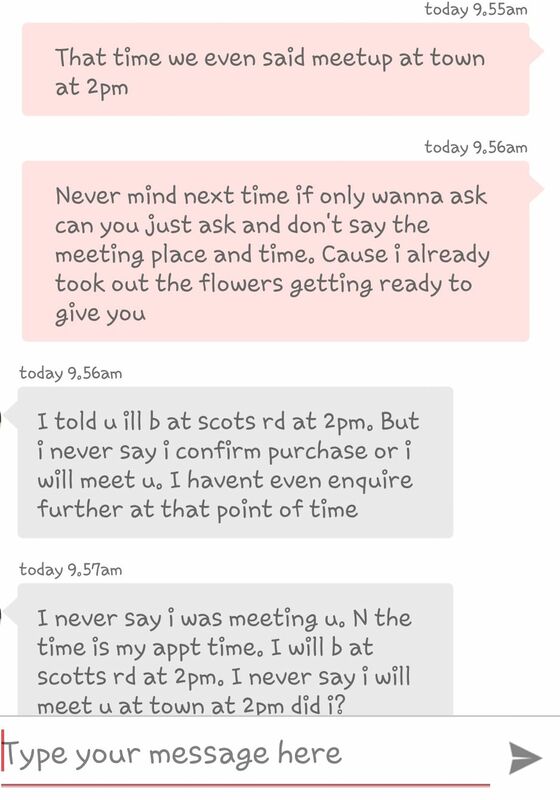 But anyway, I wanted to brush it off and let her know that how we can avoid miscommunication next time. 1. Really, I still don't get why is she telling me her whereabouts if we are not even meeting?? Do I look like I am interested in your life? NO. 2. You said it YOURSELF that if you realised it's not something to your liking, you chose to not go ahead of this transaction. So may I ask, where on earth in the messages did you let me know about this? NOWHERE. 3. 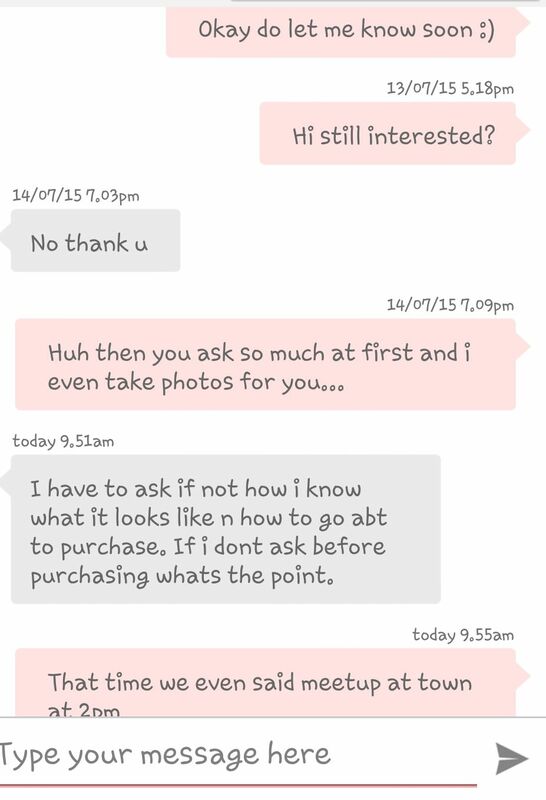 Saying that I am UNWILLING to take photos for you to provide ASSURANCE AND ASSISTANT for you. She obviously thinks she is the queen. DID I COMPLAIN THAT I NEED TO TAKE PHOTO FOR YOU at the start? NO. Where on earth did you said you need assurance from me? Oh sorry, I am not a good person to give you reassurance since I am not a Psychologist right now. But if you need any reassurance, I can always provide you the helpline number?? Assistant, wow wow look who we have here. A VIP guest maybe. Seems like what I have been providing wasn't enough to satisfy a customer here. "I suggest you not to sell anything as this buyer and seller relationship is essential to sales." I felt so honoured to have a 'How to increase your sales on Carousell 101' free of charge!! Thank you so much (from the bottom of my heart) for letting me gaining this valuable lesson to increase my sales *tears of joy . 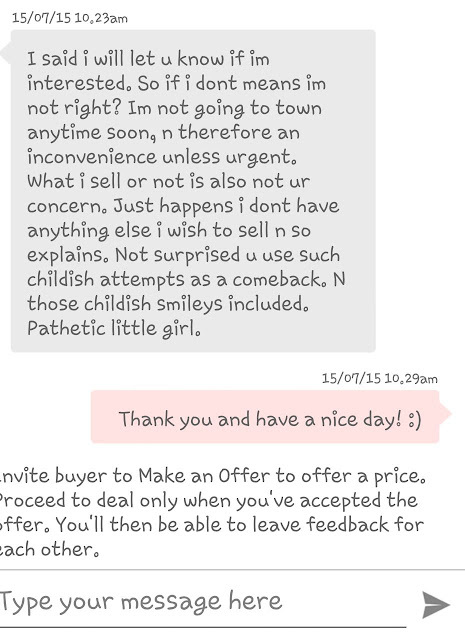 I am sure I will be building a pretty good relationship with my other buyers from today onward thanks to your advice. If you would like to purchase all my items then I won't be selling anything on Caoursell. Sounds like a good plan right? So I tried to talk some sense to her but obviously someone is too oblivious to notice that. And she likes to explain herself in all ways (just let you be). For instant, "I said I will let you know if I am interested" WOW like I can read your mind about this. If I am not wrong, you said "Will let you know". So am I supposed to interrupt the same way as you?? Nevertheless, thank you for your time (and my time) and have a wonderful day ahead while spending your 5 bucks at somewhere with better ASSURANCE & ASSISTANT provided. 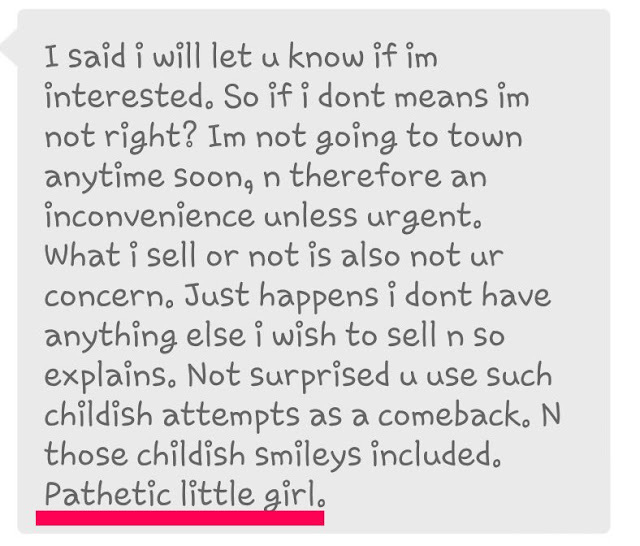 The pathetic little girl who is not so little nor pathetic after all. Actually this seems like ur fault. 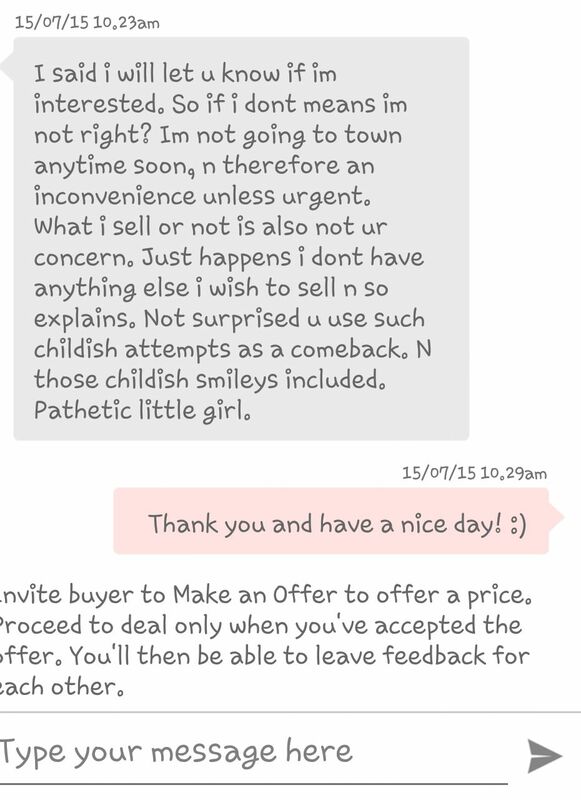 U didn't need to pick a fight with her, after all you are the seller and should be more polite. In any case, she did tell you she didn't want the item at the end. 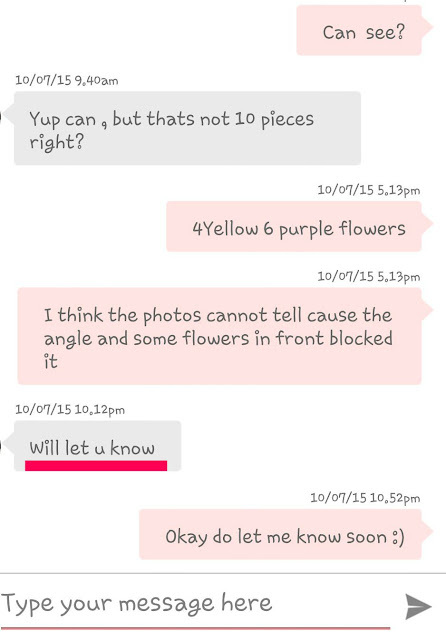 Maybe you are not getting the full picture but it seems like she was the one being rude. No one says customers are always right and we should be polite to every single customers just because they are paying for something (be in service or goods). I think this is something we should all understand. You will only be respected if you respect others too. So in this case, if she was nice enough, I would (or rather I wasn't even NOT polite to her in the first place) be nice too. P/S She only told me after I asked when she said she will inform me about it.